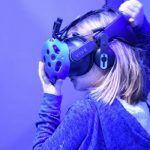 Escape VR Virtual Reality birthday parties info and birthday party packages. 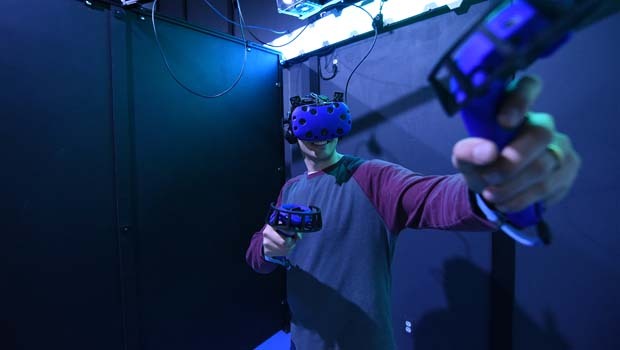 Escape VR Arcade, the state of the art virtual reality playground at Legacy 925 in Oxford, offers parties featuring single & multiplayer VR games for party goers to play.Party goers even get ample seating and tables for presents and cake. Escape to the stars and celebrate your birthday with an out of this world experience – Virtual Reality. Escape VR – Virtual Reality Arcade has several 64 square foot premium virtual reality stations (AKA Escape Pods) that allow the user to interact with his/her virtual environment. Select from a wide array of immersive worlds, games and experiences! Play solo or select multiplayer to explore new worlds with your friends and family. Dive to virtual depths, blast your way through waves of robots, or test your reflexes with virtual katanas! Escape VR guarantees to have a virtual experience to captivate all ages. Select from a Library of over 30+ single and multiplayer experiences! Adults, don’t forget… Escape VR Arcade is also hosts great parties & corporate events for any age! Select your party package to reserve time on as many Escape Pods as needed for your party! Only one person can play at a station at a time but multiple players may split time on one station. Ex – 4 people can take a 15 min turn on one station reserved for one hour. No limit on size of party. Escape VR has ample seating and tables for food/cake. You may choose to bring in your own food and drink. Escape VR will allow other customers to play on available stations during your party. Escape VR staff will ensure all guests receive equal play time. Some games may be omitted from the selection due to complexity and age, this will allow the guest to enjoy their full play time. Please arrive 15 mins to receive instruction and to fill out waivers beforehand. Waivers may be completed online. Escape VR may also open during unlisted hours for special requests. For more info on Escape VR birthday parties, visit escapevrarcade.com.